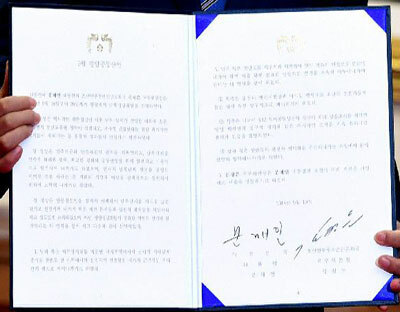 Six months since the leaders of North and South Korea singed a joint declaration in Pyongyang, they have only lived up to one of 13 pledges they agreed on. The two Koreas were only able to hold a ground-breaking ceremony for reconnecting severed cross-border railways, but actual work cannot begin while sanctions against the renegade country remain in place. The other pledges remain unfulfilled. There has been no re-establishing of a joint military committee, no conditional reopening of the Kaesong Industrial Park or resumption of tours to North Korea's scenic Mt. Kumgang resort, no reunion center in Mt. Kumgang for families separated by the Korean War, no video-conferencing reunions for separated families, no North Korean musicians performing in South Korea, no permanent closure of the North's missile facility in Tongchang-ri and no visit to Seoul by North Korean leader Kim Jong-un. In fact North Korea appears to be resuming operations at the missile facility. Nam Sung-wook at Korea University said, "The agreement itself was based on the condition of North Korean denuclearization and was basically a political gimmick. Denuclearization should have gained pace, and some clear conditions should have been attached. But without them it's all wishful thinking." North and South Korean officials also held several meetings to help the North reforest its barren mountains and bolster medical cooperation but made no progress. Since North Korean leader Kin Jong-un's summit with U.S. President Donald Trump in Hanoi collapsed, Pyongyang seems to have lost all interest in those projects. However, implementation of a cross-border military agreement, which North Korea wanted included in the declaration, has progressed at breakneck speed. The two Koreas lost no time establishing no-fly zones over the border, removing guard posts from the demilitarized zone, disarming troops guarding the Joint Security Area in Panmunjom and establishing a peace zone along the Northern Limit Line, the de facto maritime border. Instead North Korea continues to accuse South Korea of failing to abide by its pledges. According to Liberty Korea Party lawmaker Baek Seung-joo, the North Korean regime criticized South Korea 122 times in the last six months, accusing the South of violating the military pact. North Korean state media criticized South Korea 1,471 times during that period. Despite the agreement, North Korea continues to station artillery along the West Sea and protest against the NLL. Kim Do-gyun at the Defense Ministry said, "We spotted North Korean violations of the agreement involving the NLL and issued more than a dozen warnings to the North." Free access to the JSA has seen zero progress due to a lack of initiative by North Korea. The North apparently insists that UN forces must leave before it can be allowed.